Before she left, we went out for a nice meal at Bothy, a Scottish restaurant seeking to "serve modern classics with a twist." Located down an alley off the trendy Byres Road, it is a comfy stone building with dark woods and earthtone fabrics. 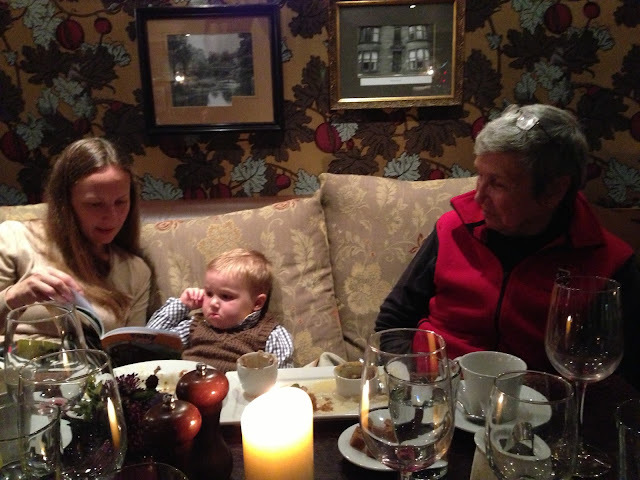 Some of the tables come with sofas, which is a good place to keep a wee one entertained. Grammar finished knitting Jack's vest earlier that day. He got an unsolicited compliment from a passing waitress, who then asked for Grammar to knit her a sweater. Although Bothy might seem fancy, it's the kind of place many attendees (including me) can feel comfortable in jeans. 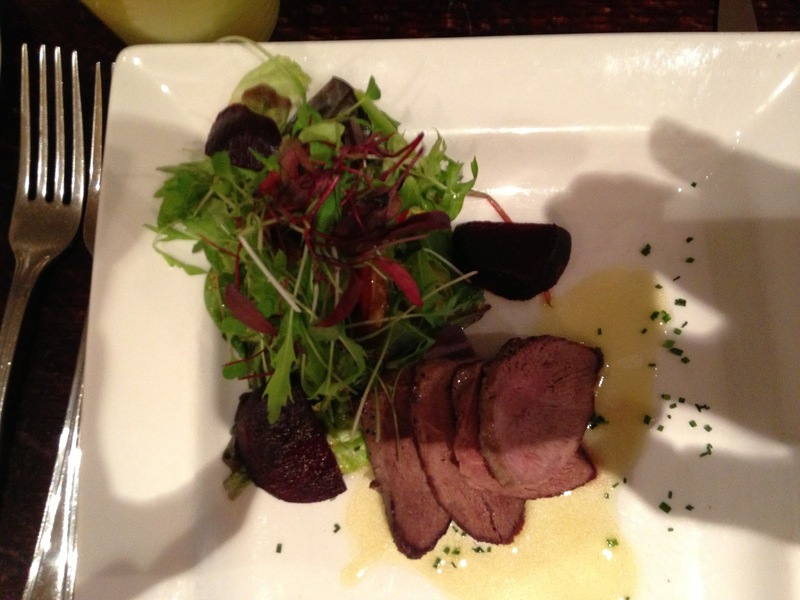 We had traditional fare, such as duck breast for me and lamb for Grammar. Our food was excellent, the ambiance was great, the service was attentive and friendly. It is now one of our favorite restaurants in the city. Kate ordered "wild pigeon" as an appetizer. Was it good? Yes; only a tiny bit gamey. More importantly, what makes a pigeon "wild" instead of...well...umm...not wild? Does "wild" pigeon mean it wasn't one of the street pigeons a block away? My understanding is that a "wild" pigeon is one you would find out in the wild (e.g., by the sea), and not on the street. Is it the same species as a street pigeon? Yes. Would a street pigeon taste the same? I guess so. Pigeon looks kinda tasty, doesn't it? Also note the shadow from Kate's phone and hands. No pigeons, wild or otherwise, to be found after dinner on this traditional tenement house street. Grammar departed on Thursday. Our next guest, Nancy, arrived on Saturday. Nancy is one of Kate's best friends and former roommates from Cornell. She was a bridesmaid in our wedding. Unfortunately, we haven't been able to see her very often since the wedding. That's because Nancy has lived in London for the past thirteen years or so. We've been able to visit her in London and meet up at some other weddings and gatherings in the States, but not as much as we would like. Nancy is one of my inspirations for living abroad. 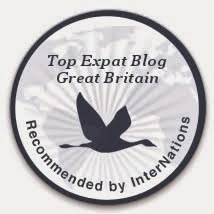 She has lived more than a third of her life as an expat. Thus, I made sure to ask her vital questions like, "Do they show any college football and basketball here?" and "Can you find Cheetos in the U.K.?" She was kind enough to explain mysteries like whether women throughout the U.K., and not just Scotland, wear leggings all the time. Or to note that, hey dummies, you need to put salt in a cup at the bottom of the dishwasher or else the dishwasher will break, hence the bright red "Salt" light glowing on the door. Her visit was more of a hang out and chat time, rather than go around and be tourists. Nancy has been to Glasgow before, so there was no need to be especially touristy. Instead, we took walks along the canal and to see the all-important diggers at the construction site. We watched Downton Abbey. We made stir-fry and ate out on the deck. One night we went for an Italian dinner at Firebird restaurant near Kelvingrove Park. We have eaten at Firebird three times so far, and it's another of our favorites. Although it is as much a neighborhood bar as a restaurant, it's a good place for kids (you might notice that is something of a requirement for our meals nowadays) and adults -- noisy and boisterous, quirky interior shape/layout, a fishtank, wooden walls that roll up garage-style for al fresco dining, thoughtful beer menu (let me recommend the Orkney Brewery's Skull Splitter ale), etc. Firebird hosts a pub quiz night I hope we might be able to try out soon, since we greatly miss our usual Tuesday pub quiz nights at the Flying Saucer in Raleigh. After dinner we headed over to Kelvingrove Park to let Jack burn off some pizza calories. They have a nice playground for the kids, and even a skatepark -- generally used more by bikes and scooters than by skateboards -- for the riffraff. 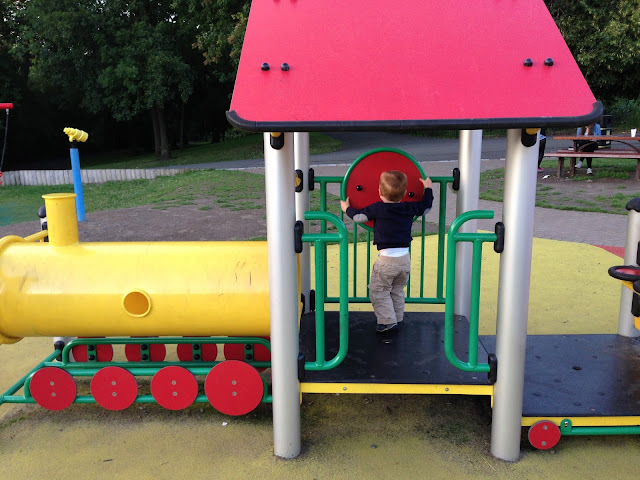 Suffice it to say that Jack's "steering" of the "train" would result in a crash. 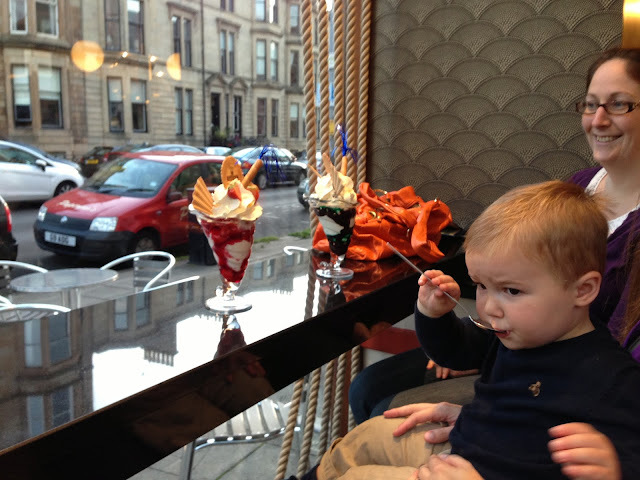 After burning off some calories, we promptly added more with a stop for ice cream at Nardini's ice cream parlour. Jackson assumes that both Kate's and Nancy's sundaes are his. 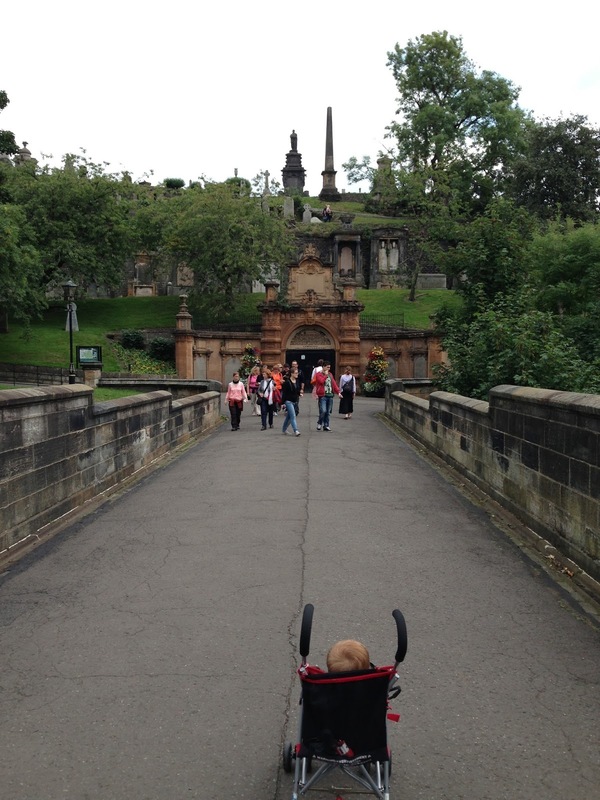 On Sunday we headed off to be a little touristy, with stops at the Glasgow Cathedral and the Necropolis. 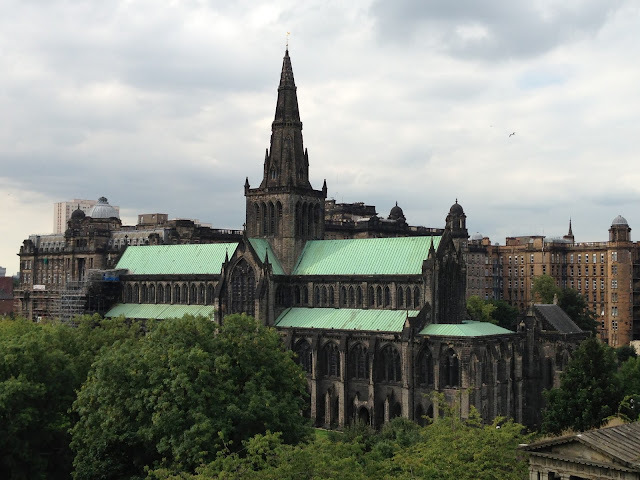 The cathedral was Scotland's most important church prior to the Reformation. It suffered some damage from the conflicts between the Catholics and Protestants, including the loss of its original stained glass windows. Inside there is a centuries-old wooden door with bullet holes. Nevertheless, it's the only medieval cathedral on the Scottish mainland to have survived the Protestant Reformation without losing its roof. It would've been a shame for Glasgow Cathedral to have lost its beautiful barrel vaulted roof. The cathedral has not enjoyed the inside and outside cleaning that many of Europe's cathedrals have undergone in recent decades, so it looks a little grimy. Most important churches and cathedrals in Europe have cleaned off the soot and dirt that makes the stone look so dark. Not this one. Since the Bishop of Glasgow was primarily responsible for the university's founding, the University of Glasgow held its classes for a couple of decades on the cathedral's grounds starting in 1451. For the next two centuries, the bishops served as the chancellors of the university. If it looks to you like the cathedral is leaning slightly, you're correct. 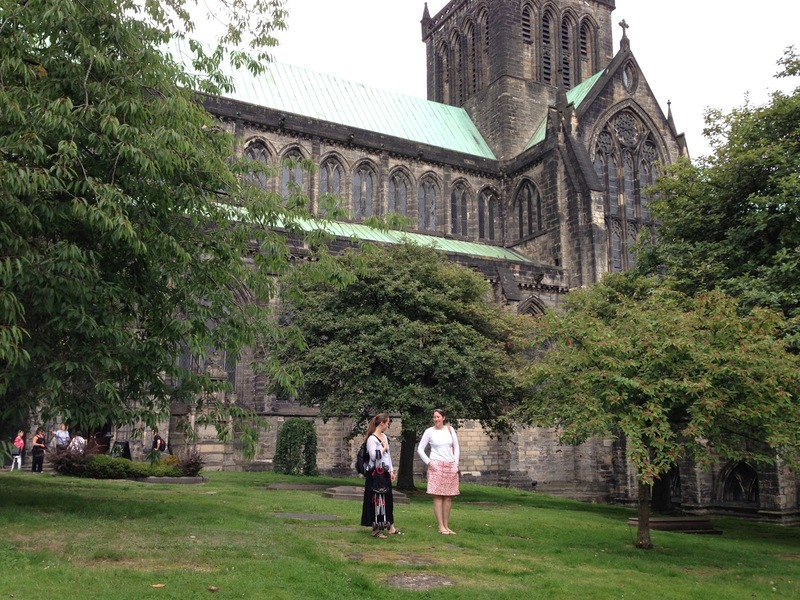 Kate and Nancy talking outside Glasgow Cathedral while Jackson roams the cemetery. 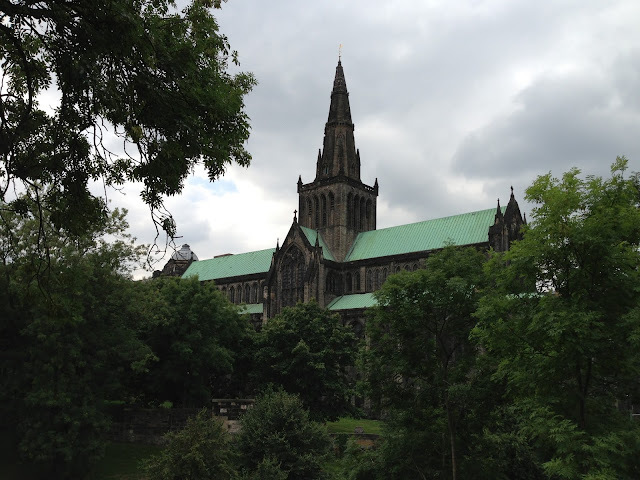 Although the cathedral is supposedly located where the patron saint of Glasgow, St. Mungo, founded his church, the building is no longer used by the Catholics but rather by the Church of Scotland's Presbytery of Glasgow, which means it is now a Protestant church. 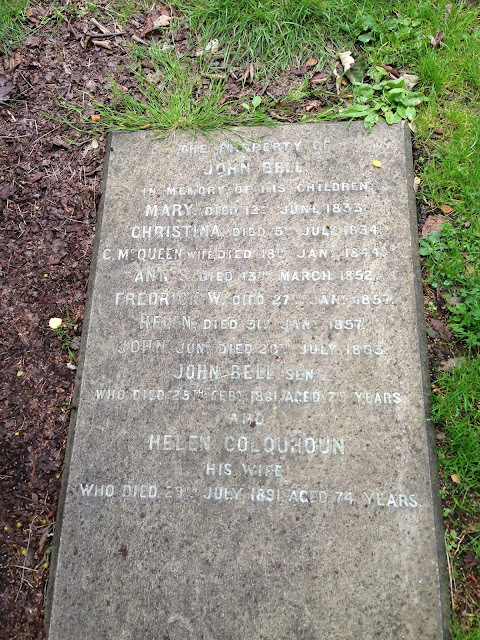 Assuming Helen was John's only wife, Helen was only 16 when her first child died. Over the following 30 years, she lost six more children. She and John then had nearly 17 years together after all seven children had died. She was alone for her final 10 years. Happy Sundays, or dead and buried Sundays? After exploring the cathedral and grounds, we headed across the "Bridge of Sighs" -- apparently a ripoff of the name of the bridge in Venice -- to the Necropolis. Jack eats a bagel while pondering the Necropolis rising before him. This Victorian-era graveyard for wealthy merchants isn't pristine; it's more like a New Orleans graveyard, with decrepit tombs, broken gravestones, vines and moss and nests entwined through the stonework. This would be an excellent place for Halloween, if it ever catches on as a holiday here. 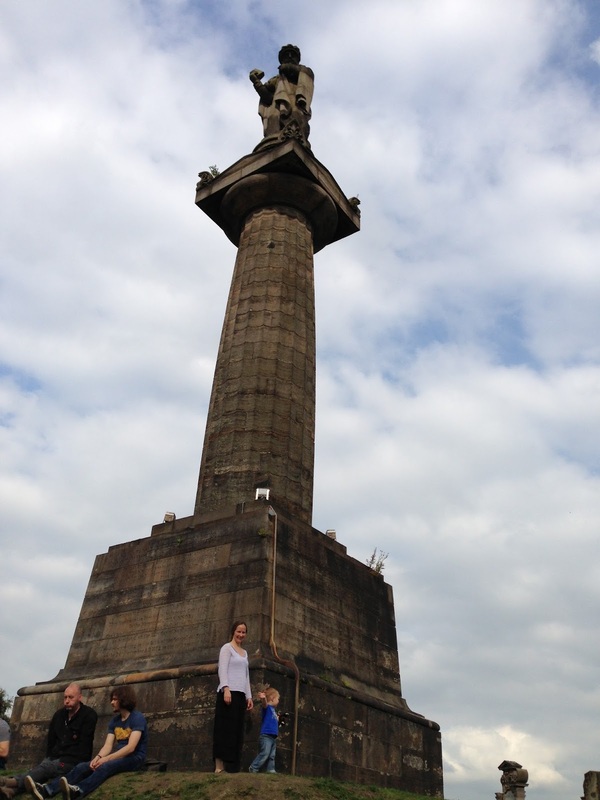 Jackson careens around the base of the statue. 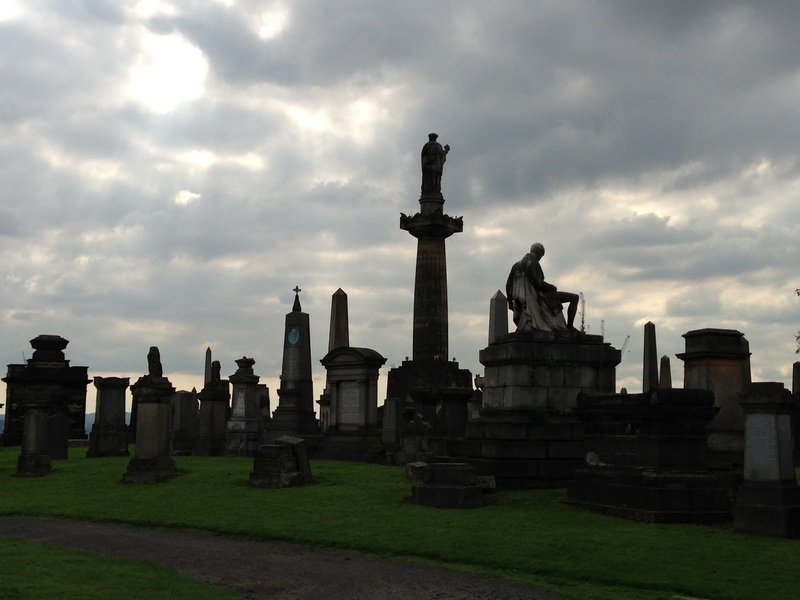 Surely someone has written a Gothic story or novel with this as a setting. 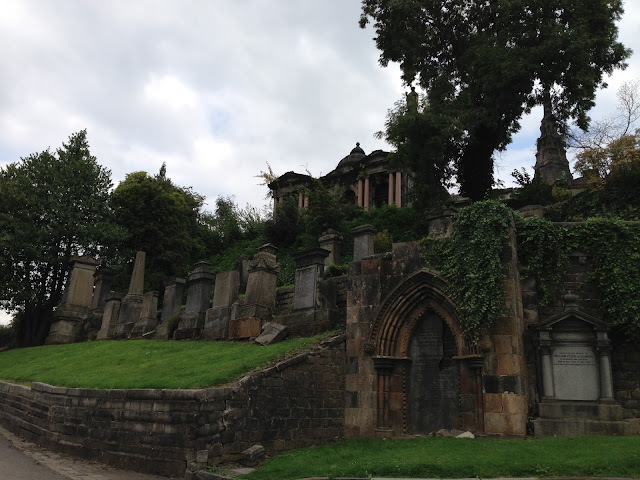 I quite like the Necropolis. Just as during our visit to Glasgow last January and I trekked up to the top in the wind and rain, I found it to be an appropriately moody and gloomy place, better seen in dim light than sunshine. Oddly, I find it to be a place where I want to have a picnic with Jack. Doesn't this look like a cheery spot? 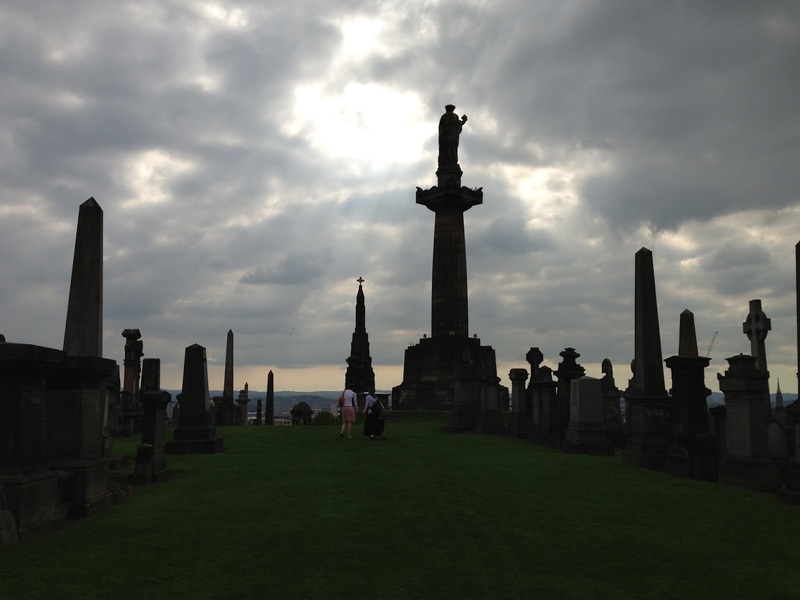 The sky is parting for Kate and Nancy as they approach John Knox. John Knox's view of the Glasgow Cathedral. Nancy left on Monday. It was great to see her for the first time in years, and we really appreciated that she spent her bank holiday coming to visit. It was not too sad a farewell, though, because we expect to see her again this coming Monday when we visit London. More on that in an upcoming post. 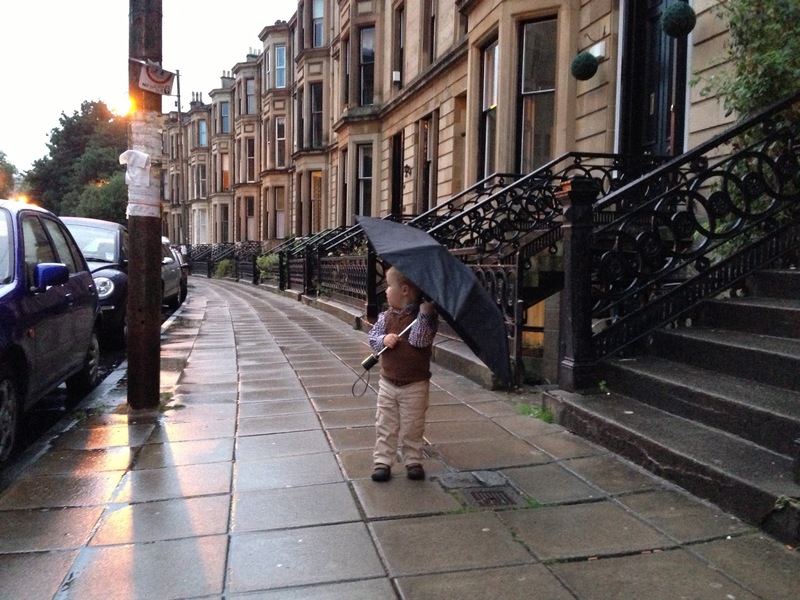 Love the picture of Jackson with the umbrella on the sidewalk--looks so European! And I also love his sweater vest. He is looking so grown-up! He looks older to me, too. But then I'll see him next to some three year olds and he look really young. Hi Brian- it's Rachel. I'm enjoying your blog! On the John Bell gravestone, it looks like maybe he did have a first wife named C.McQueen (the third name down the list) who died in 1844. I think I see the word 'wife' after that name. Hi, Rachel! I think you're probably right. Oops.